AllSafe Pool covers are an ideal complement to any pool. Homeowners intending to purchase a mesh pool cover often have queries regarding this option. Here are answers to 7 of the commonly asked questions about buying mesh pool covers. 1. What is a mesh pool cover? This is a type of pool cover designed to keep debris from your pool. Its mesh fabric allows rainwater to sip into the pool but keeps other impurities like leaves or gravel from entering the pool. Therefore, a mesh pool cover offers a maintenance function to your pool. It also keeps the pool secure when it’s not in use. Mesh pool covers are a special type of allsafe pool covers that provides both safety and maintenance benefits. 2. How safe and strong are safety pool covers? Safety is a primary concern that pool owners with kids have. The strong straps that hold the mesh pool cover in place enhance the pool owner’s peace of mind by limiting the risk of a kid falling into the pool. In fact, the pool cover can even support the weight of an adult. Mesh pool covers have undergone independent testing to ensure they meet industry standards (stipulated by the American Society for Testing and Materials or ASTM) for safety and build quality. 3. Is a pool safety cover easy to use? Replacing a pool safety cover does not require painstaking effort, although it requires some degree of physical strength as it’s usually heavy. 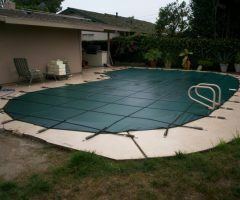 Pool cover removal may take a maximum of 30 minutes, while covers that are more complicated require more time to remove. However, setting the pool cover in place would necessitate experience and the effort of at least two people. Thankfully, once it’s set up, the mesh pool cover would only require periodic maintenance to keep in good working order. 4. Why choose a mesh pool cover vs. other covers? Mesh AllSafe pool covers feature a sturdy build quality, making them an ideal pick that provides longevity of use. Most pool owners invest in a pool cover that would not require replacement in the short-term. A mesh pool cover also serves as a safety complement to your pool while also maintaining it by keeping it debris free. It also allows rainwater to sip into the pool, a quality that an automatic pool cover would not boast. 5. How do I purchase an All-Safe mesh pool cover? An All-Safe dealer within your locality will guide you through purchase process. Once you submit a no obligation estimate form, the independent dealer will make a site visit to discuss with you the best pool cover for your pool or spa and offer you expert advice. Be sure to inform them of your preferences such as color choice or other subtle details you would like your mesh pool cover to feature. Mesh Allsafe Pool covers available colors range from green to black. 6. Can a safety pool cover be installed on any pool? Standard mesh pool covers can fit onto rectangular pools. Depending on the size of your pool, or its shape, your local dealer can tailor the pool cover to fit the pool. However, mesh AllSafe pool covers are suited to unobstructed pool areas and pool decks that are not elevated or lying at an angle, as this would pose a challenge in installing the cover. The functionality of the cover is also enhanced on flat surfaces. By consulting with a local All-Safe dealer, you would be in a better position to understand whether the safety pool cover would be best suited to your pool. 7. Can I install the pool cover myself? Self-installation is suited to individuals with a knack for handling tools like hammer drills. Otherwise, the job of a pool cover installation would best be left to a professional who understands the art and is experienced to handle the task. This limits risks such as damage to your pool deck and upholds your warranty without negating the appearance of your pool. Overall, All-Safe mesh AllSafe pool covers provide great value to pool owners. Backed by over 20 years in the pool cover business, the company is a reliable consideration for your pool needs.